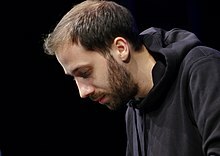 Gold Panda (born 1980) is a British electronic record producer, performer, and composer from the United Kingdom. He was born in Peckham, London, England, and was raised in Chelmsford, Essex. He lived in Japan and studied at the School of Oriental and African Studies at the University of London. Gold Panda released several small-issue 7" records and singles in 2009, and in 2010 he signed with Ghostly International to release his debut full-length Lucky Shiner. In 2013, Gold Panda released his second album, Half of Where You Live. On 27 May 2016, Gold Panda's third album, Good Luck and Do Your Best, was released via City Slang. ^ Will Dean. "Gold Panda: Lucky Shiner | CD review | Music". The Guardian. Retrieved 2016-06-28. ^ "Gold Panda". Iamgoldpanda.com. Retrieved 2016-06-28. ^ Review of Lucky Shiner, NME, October 9, 2010. ^ Review of Lucky Shiner, Rock Sound #141 (November 2010). ^ Review of Lucky Shiner, Uncut, October 2010. ^ Review of Lucky Shiner, MOJO, November 2010. ^ "Gold Panda Announces New Album Good Luck and Do Your Best, Shares "Time Eater" Video". Pitchfork.com. 2016-02-23. Retrieved 2016-06-28. ^ "New Release: Gold Panda: Companion". Pitchfork.com. 2011-03-22. Retrieved 2016-06-28.